Right-2Line™ Duct removes the single line that represents the trunks, branches and fittings of your duct design in the Right-Draw® screen and replaces it with accurately scaled two-line duct systems, resulting in CAD-quality designs. View overview video. Right-2Line™ Duct turns your simple duct design into a professional looking CAD quality file in just the click of a button. Easily view both single-line, two-line and combination branch designs. This program allows you to easily toggle between one and two-line branch designs for ease of use during the design process. The user may also choose to mix both two-line and one-line branch designs. Adjust which side trunks reduce. Easy to use drag-and-drop symbols for duct components. Duct components snap together and automatically recalculate. Duct components interpret usage situation and use designer preferences for fitting choice. 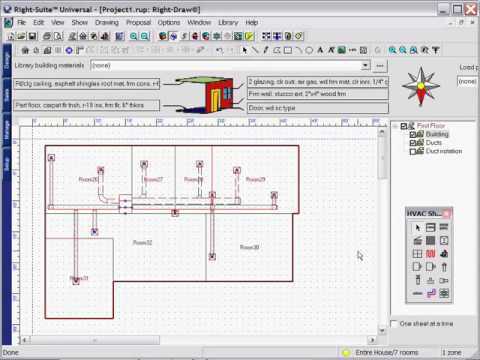 CAD quality 2-line drawings for duct components. 2-line fittings automatically adjust symmetrically to size and angle as required. Flex ducts can be modified to include easy bends. Automatic recalculation as flex ducts bend and grow in length. 2-Line duct layout can be written back to CAD without owning CAD. Turn on/off register throw arrows. Non-congruent fittings will be displayed in bold red or any other color preferred. Right-2Line™ Duct separates you from the competition by making any drawing look professional with the click of a button. Builders can then seamlessly access these plans, creating a professional line of communication and a paperless office. Additionally, increasing clarity of the design plan can help to reduce installer mistakes and help a designer to better visualize their design within the space. The Right-2Line module removes the single line that represents the trunks and branches of your duct design in the Right-Draw® screen and replaces it with accurately sized and drawn two-line duct systems. Right-Draw® and Right-D® or Right-Duct™ (HRAI) and either Right-J®, Right-CommLoad™, Right-N® or Right-F280™.